A week ago today, my boy turned 2, and I have finally got the energy to write about it! As you know, I having been preparing for it for quite some time now, so in a way I was glad the day had actually arrived. The evening before, we had a mini birthday tea with the extended family, so I baked a victoria sponge, and got an amazing cake topper from Evergreen Body Care of Chunk. 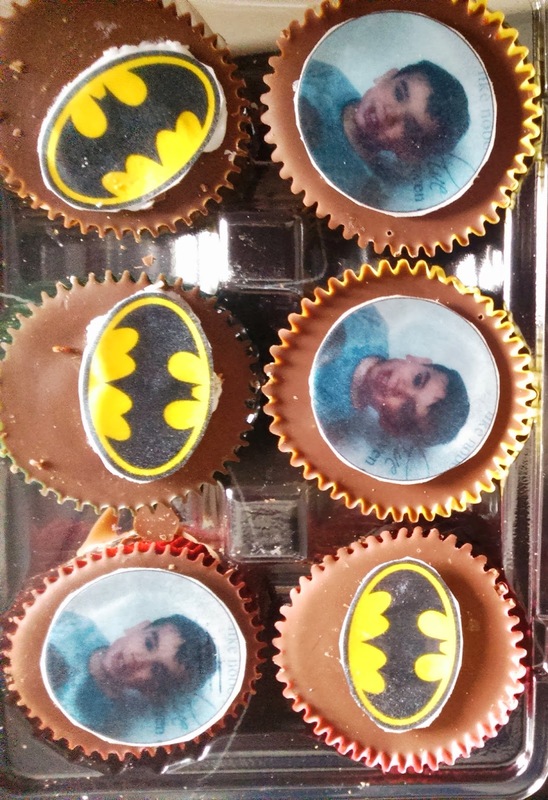 I also got some mini toppers of the same picture, along with some batman and rugby balls, and baked some chocolate cakes with a blob of jam in each centre. Considering I'm no chef, they all tasted yum! The toppers are edible, and all I had to do was email the company with the picture and it was on my doorstep days later, so I was a very happy bunny, and they added a quirky little feature to the buffet that certainly caught the kids' eyes. For the buffet, I bought veg and dips, rice cakes, crisps, and lots of frozen food from a couple of supermarkets to make it quicker and easier for me, because cooking, preparing myself and Chunk, and getting everything to the venue all by my tod was not an easy feat! For the party venue, I invited 6 toddlers to indoor play centre Funplex. I chose it because it's the perfect size for a party; There are plenty of areas to play, with slides, climbing frames, soft ball shooting area and even an under 1's section. What I love about it, is that you can see the entire centre from wherever you are, unlike some play centres, so there's no concern about your children running in two different directions and fear of them managing to get out of the building. There's only one entrance and exit, and it is completely open-planned, so very toddler friendly! Chunk and his friends loved Funplex, and I managed to use one of the party rooms, which was painted with various fairy tale characters, and was a good space to put the buffet, and for the adults to sit and enjoy a cuppa whilst the kids ran wild. The room also had a large window, so you could literally watch the children on the apparatus from your seat. I chose a weekday morning, so it was nice and quiet- we practically had the whole place to ourselves for 3 hours! The other mums loved it so much they suggested we make it a regular play date, as child entry is cheaper than most other centres in the area, and adults are free. The kids had an absolute blast, and we actually stayed nearly 2 hours longer than planned, and the staff were brilliant about it! They even offered squash and plastic plates, because I had forgotten those key parts of my buffet (not bad considering I did EVERYTHING by myself this year I might add!). I loved that all of the areas were secure and well-padded, so I was able to trust Chunk to run around without me lagging behind him, and he really loved the independence! For the party bags, I was let down MAJORLY by the company who agreed to make the personalised chocolates for each child. They assured me the week before that the order was scheduled and would be posted out ready for the party, and then in the days leading up to it they no longer replied to me! I got a response AFTER the party saying they had made the order but it hadn't been sent out. Due to this I no longer recommend using chocolatemadness.co.uk at all, especially when it comes to ensuring your products actually arrive for your party! So as a last minute idea, I bought some pirate cups, hats and colouring books from the good old Pound Shop, and then added sweets, gingerbread biscuits and these cups became the party bags. After last year's birthday cake almost killed me, I got the amazingly talented Daisy Brydon to make the cake, and asked for it to have a theme from the film 'Night at the Museum' which is still Chunk's favourite film. She drove the cake down from London on the day, and the parents and kids were just as amazed as I was. It had all Chunk's favourite characters: Rex, Dum Dum and Dexter being the main ones, as well as a lion and elephant. The detail was amazing, and the chocolate cake inside was devine! Each character was edible, as they were made from rice crispies and modelling chocolate, so my sister enjoyed eating Rex's bum the day after! I cannot thank Daisy enough for doing it, especially as she was manically trying to finish a cake for the BBC at the same time as making one for little old Chunk! I would definitely recommend using Daisy if you have any big celebrations coming up, as she really does cater to what you want, and she is so lovely to talk to which helps a lot I can tell you! Cake Maker Daisy and Me! Overall, it was a fabulous day and Chunk (plus the other 6 toddlers) all crashed out for huge sleeps after the party. I cannot forget the smile on Chunk's face as everyone sang happy birthday to him and watched him blow out his candles. I have never seen him beam so much in his little life, and he seemed so in awe that people were singing for him. Let's just say my tummy tugged with huge, bubbly love and I had to stop my face from leaking in public! We then got home to find Uncle Rich and Auntie Nat had bought him goldfish and put them in my lounge. Errr thanks for more daily chores for me to attempt to do guys, especially when Chunk killed one of their fish a few months ago by lobbing toys into the tank! To get them back, here were some flattering shots of them just to give you a good laugh! Overall, it was a day filled with wonderful memories, and I would definitely like to do the same activities and food for him next year! Sounds like a lovely fun birthday. Happy birthday Chunks. May life brings you all happiness and laugher. Glad that you both had a fantastic day. Great idea for party bags in there! Funplex sounds great! And what a busy birthday he had! Looks like you had so much fun. Shame about the chocolaye company but sounds like you did a brill job of organising it all. Kids parties are hard work! wow that cake looked amazing!!!!!!!! Oh wow fab cake and awesome day! Thanks for linking up to #brillblogposts please do link back or add my badge! Thanks! Wow what a birthday!! Looks like so much fun! Childrens birthdays are so very tiring though! Ahhh lovely photos - looks like you all had a fab time!